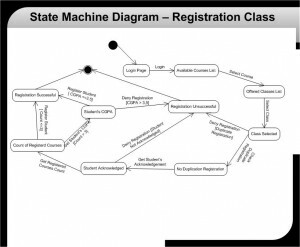 •	In addition, you will also need to create a state machine diagram for the Registration class (the class that maintains the registration of a student in a class). 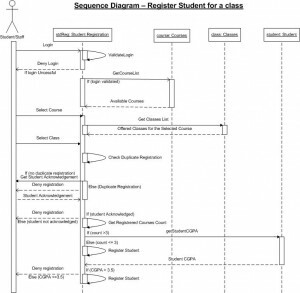 •	Create a sequence diagram for the Register a Student for Classes use case using the Rational Software Architect software in the Citrix iLab environment. 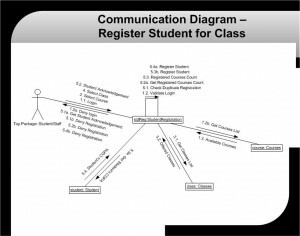 •	Create a communication diagram for the Register a Student for Classes use case using the Rational Software Architect software in the Citrix iLab environment. •	Create a state machine diagram for an object of the Registration class (the class that maintains the registration of a student in a class) using the Rational Software Architect software in the Citrix iLab environment. •	Copy and paste the diagrams (sequence, communication, and state machine diagrams) into one Word document. Save your document with the file name CIS339_Lab4_YourName. Hi, I purchased Labs 1,2,3 from you and so far i have got full marks. This lab is really difficult. Have you followed all the instructions to create these diagrams. I just want to make sure that i dont face any problems afterwards.